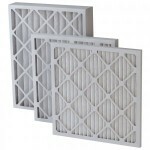 You are at:Home»Filters»How often should I change my air filters? Change your air filters on a regular basis. Dirty filters are around 25% of the problems that result in air conditioning failures. Dirty air filters allow large amounts of dirt, irritants, and dust to flow back through your air conditioning system and contaminate the air. You and your family are breathing this very same air. Change it when you think your air filter is dirty. Think about all that dirt still getting through and floating in the air you are breathing. It is like that for your air conditioning system too. All that dirt and dust ends up collecting on the fan motors, electrical components, fan blades, coils and duct lining. After some time this buildup will cause the system components to fail, short out, or even catch fire. How often you change your filter will depend on other factors in your home. Did you know that pets and children create more dust and dirt than a home without pets or children? Pets bring in more dirt from outside. They also have twice as many feet that move faster than humans that kick up more dust from the floor causing it to be picked up and circulated back through the air conditioning system. The best way to determine if you need to change your filter is to visually inspect the filter. Do not cover up the returns with furniture or fabrics; leave the return open and visible so that you can check it often. We all have poor memory when it comes to our filters, so an obvious filter location will help. If you are like me, I cannot figure out the FILTER setting on the thermostat and be able to reset it without searching for hours for the instructions for the thermostat. Here’s the best home improvement tip of all time: If the filter looks dirty, change it. If that is monthly for your home, change it monthly. Do not rely on the filter rating on the package. The rating on the package is only a guideline to show you how much more particulate the filter can stop and is very misleading. If it is White then it can stay. If it is gray then it must go.